Pepper the robot has consistently hit headlines since its introduction several years ago. The humanoid robot is a surprisingly regular sight in Japan, despite being a rarity in the U.S. and Europe. Created by mobile technology mega-corp SoftBank, we were pleased to see Pepper on duty not only in SoftBank’s many stores, but helping out the public in other places too. Watching Pepper out in public gave us a glimpse of a joyous robot-filled future. Sharing space with an actual, functioning robot on an almost daily basis was like our wildest sci-fi dreams come true. Pepper is the real deal. It carries out increasingly complex tasks, can verbally interact with you, and can even read you facial expressions to judge how you’re feeling. It has been employed in various jobs over the years, from being a priest to selling phones. Watching Pepper out in public gave us a glimpse of a joyous robot-filled future, but also grimly reminded us about the danger of instilling automations with personality — real or imagined. It gives them the power to play with our emotions, as it’s worryingly easy to forget they’re not human. Should this put us off chatting, and potentially caring about, robots? Pepper first greeted us at the monorail station at Haneda airport in Tokyo, where it was dressed in a stationmaster’s cap and jacket, providing information to anyone who stopped to ask. We were in a hurry, just like everyone else around Pepper, and an endless stream of people moved past the ‘bot, as it moved around in the crowds. We didn’t see anyone stop and chat. The next time we came across Pepper was in a high-end karaoke establishment in Roppingi, where the robot was greeting eager singers as they entered. No doubt Pepper was willing to provide more information if asked, but not only did no-one stop, they didn’t even acknowledge the robot when they walked past. Pepper can be found everywhere from inside banks to hanging out in colleges. In conversations with friends, we were told about Pepper hanging out in dentists offices and at golf courses. It’s probably not performing any oral surgery though. Pepper can be found everywhere from inside banks to hanging out in colleges. 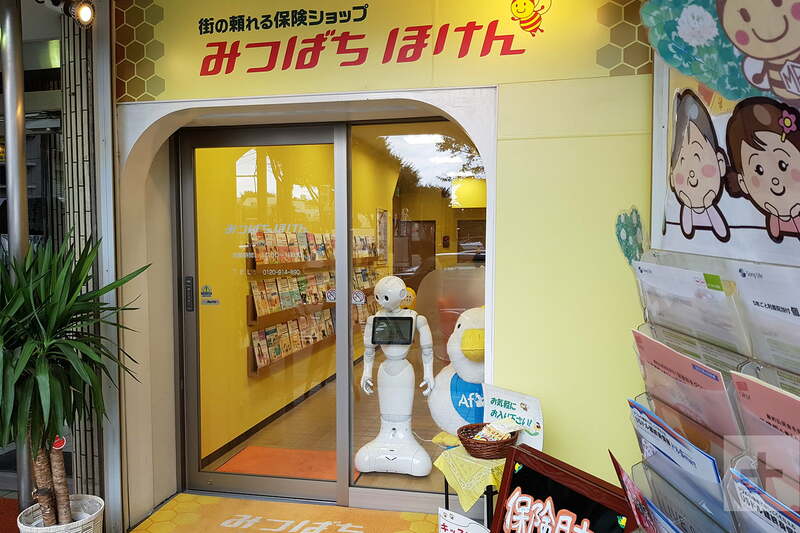 SoftBank stores commonly have a Pepper on duty. In one large store near Shibuya, three Pepper robots lined up just inside the entrance, all displaying text on the chest-mounted screens. Eyes eagerly scanning faces, all the Pepper robots made eye contact and sometimes calmly spoke Japanese to anyone walking in, but they were largely ignored. Over the next few weeks, we spotted Pepper often staring out from behind store windows, looking at the world passing it by. It was a rather lonely, expectant sight, like a child with its face pressed up against a window, waiting for a parent to return from a long day at work. That was sad enough, but worse was seeing Pepper powered down. Its head tilts towards the ground, its arms hang limply by its side, and the screen shows nothing more than a black void. Motionless, Pepper stands in the corner like just another piece of electronic equipment, waiting until it’s needed again. We were seeing Pepper being largely ignored. Why? No, it isn’t really a “new” thing anymore, having rolled around Tokyo for a while; but it’s still a robot. 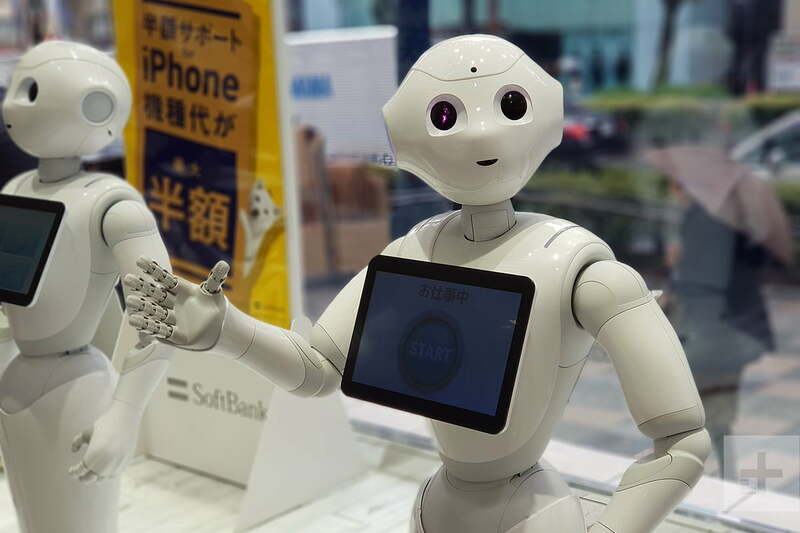 Even in Japan, where robotics is popular enough to be a mainstream hobby, could everyone have gotten used to seeing Pepper that it just blended into the background? Or, are people still too nervous to talk to a robot? Either way, eager-to-please Pepper wasn’t really performing its robot-duties, and it was impossible not to feel a little sorry for it. Whether it was waiting for us to go into its store, or keen to impart information to the lost or confused, it didn’t seem like Pepper was leading a very fulfilling life. We wondered that if Pepper’s working day was filled with human interaction, and the feeling of a job-well-done, then maybe it wouldn’t look so downcast when sleeping? Why do we care so much? What does it matter? After all, Pepper doesn’t have feelings. We humans have feelings though, and it’s very easy to project them on the already anthropomorphized creation — it takes on a vaguely humanoid form, with a cute, human-like face. Imagining it being pretty disappointed at the end of the day, when it hasn’t helped as many people as it had hoped, is a sad thought. There are plenty of people who do chat to Pepper and really enjoy it. We spoke to Tokyo resident Erina Takasu, who told us about several enjoyable experiences with Pepper. “Pepper was rare until a few years ago, but recently it has been introduced in more places,” Takasu told Digital Trends. She also said how popular Pepper is with children, something we heard from several other people used to observing the robot. Notice the use of the word, “him?” Strictly, Pepper is an “it,” but like us and likely many others, Takasu has humanized the robot. Whether this is a bad thing or not may depend on your viewpoint. To us, it’s not much different to calling a car or boat, “she,” or imagining your pet making rationally thought-out, conscious decisions. Next time you see Pepper, stop and chat. We’re going to make an impassioned plea. Next time you see Pepper, stop and chat. Even if you can only manage a simple hello in Japanese, give it a try. If you find a rare Pepper that speaks English, or your native language , see what Pepper wants to tell you. In the near future, more robots will move around among us, all ready to provide undivided attention, friendly conversation, and all kinds of handy tips. We’ve got to get used to talking to them, and it’d be lovely if they went to sleep happy at the end of the day too.